It's no mystery that booksellers are an integral part of the word-of-mouth that drives book sales. Online algorithms can only do so much, and they often do so imperfectly, but a human touch and personal recommendation will never die. Wendy and Michael Bumsted of Whodunit? Mystery Bookstore in Winnipeg are two of the booksellers killing it with their hand-selling techniques. First opened in 1994, Whodunit? Mystery Bookstore was founded by Gaylene Chesnut and Henrietta Wilde amidst a wave of crime fiction specialty stores all over North America. 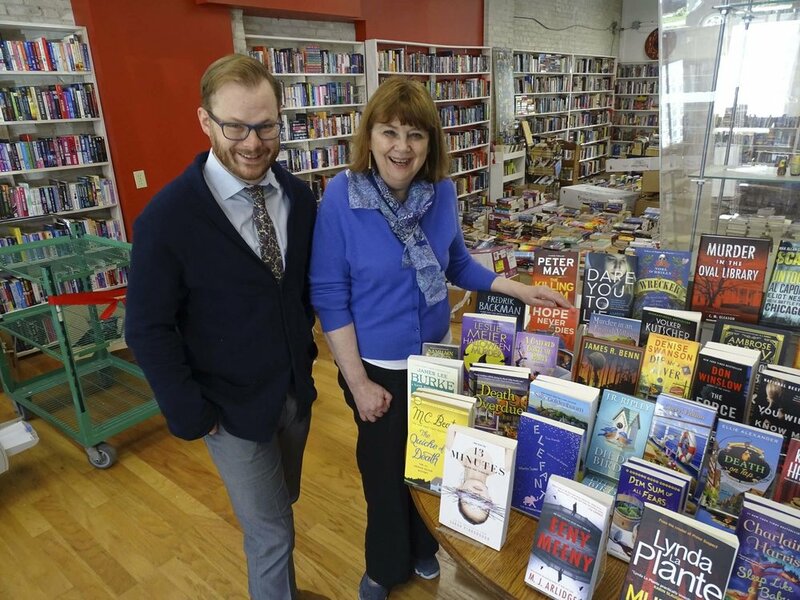 When long-time customers Jack and Wendy Bumsted took over the shop in 2007, the store continued to feature new and used crime fiction. It also provided a home base for their youngest children, Sian and Michael, who contributed to the store while pursuing their own academics and careers. Photo of Wendy and Michael Bumsted, credit Maureen Scurfield, Winnipeg Free Press. In 2013, following the completion of his PhD and receiving the Libris Award for Young Bookseller of the Year, Michael transitioned into a permanent role at Whodunit. Michael and Wendy then began a plan to expand the store both in terms of scope and size, which culminated in August 2018 with their long-awaited move into the much larger space next door to their original location on Lilac Street in Winnipeg's Crescentwood neighbourhood. 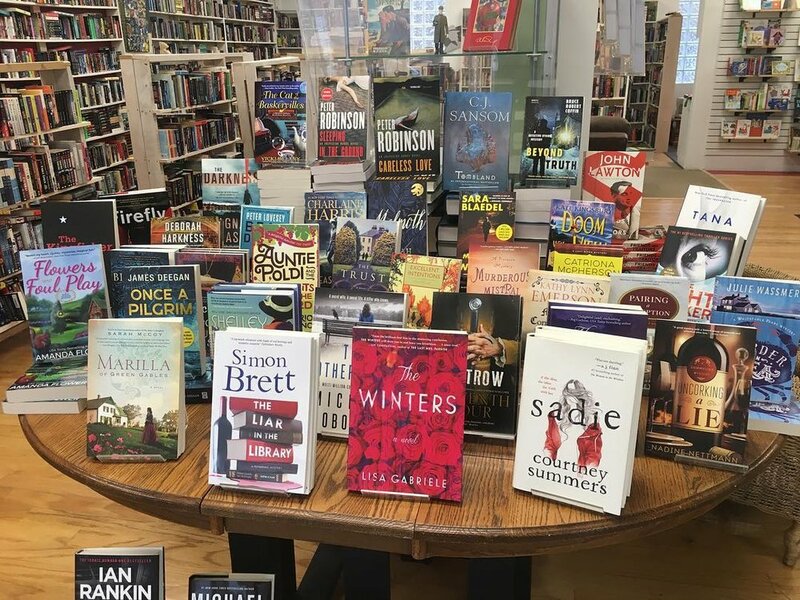 Now (mostly) settled into their roomier quarters, Whodunit still stocks over 15,000 crime fiction titles, but also has growing stocks of children's books, local interest titles, general fiction, and special orders. A changing community, which has warmly received the change in venue and services that Whodunit has to offer, is allowing Whodunit to flourish going into this, its 25th year. Wendy: Val McDermid. She's an interesting writer and person with a great range of characters in her fiction and opinions for herself. Michael: It should, probably, be Agatha [Christie]. While Sherlock Holmes is by far the most famous fictional detective, Christie is probably the most influential author, and, to this day, by far our bestselling author, year to year. However, selfishly, I have to admit that if given one opportunity, I would choose Neil Gaiman. His first three solo novels, Neverwhere, Stardust, and American Gods are the most commonly read books in my home, and are all exactly the kinds of books we wanted to be able to sell in addition to mysteries when the store started to open up its shelves to other genres. Wendy: Bookstores themselves. The way that the spaces become so much more than just a shop, but, when run properly, can become hubs for culture, for connection, and for social change is something that's not unique to bookstores, but is certainly rare to find in other kinds of retail spaces. Michael: This is not, I must admit, where I expected to find myself. However, there's a beauty in matching customers to books or authors. The feeling of satisfaction that comes from selling a customer a book that you love is great, but it's definitely surpassed by finding a book that's perfect for the customer but might not necessarily be a favourite of yours. Michael: We did a launch event for a local author several years ago that we knew was going to be successful. Even by our own measure, however, we were surprised by how many of the books we had ordered for the event that were sold prior to the Sunday launch. I found myself at a big box chain, which had conveniently stocked the book. Having the invited guests of the event watch as I pulled up at the last moment with two dozen more copies of the book from an "undisclosed source" was something that still makes me smile. Wendy: Supply chain. Particularly in a smaller store, the tension between not overstocking, or understocking is very real. Even with the advanced data that we collect (or have access to via BookNet), there are still occasions when a book disappears more quickly than we can order it (and we lose sales to other vendors) or a book we thought would do well languishes on our shelves for no clear reason. This is particularly true of books in long-running series, as sometimes the seventh book of a series will fly off the shelf with no particular reason or track record, or the ninth will not go at all. The time that it takes to adjust to these trends, and the time it takes to re-stock when you have a run on a title, is something that we always struggle with. Michael: Perception. This is probably particularly noticed by us as we have just made the move to expand our store, but nearly every day we have someone who remarks on how surprised they are not just that we still exist, but that we felt it necessary (and possible) to expand. The idea that "young people aren't reading books anymore" or the question "Doesn't everyone just read on their Kindle?" aren't borne out in our experience in the shop, where our customers are getting younger and a fair number of our older customers who eschewed us for digital have come back to reading paper books for a variety of reasons. Wendy: The Stranger Diaries by Elly Griffiths. A stand-alone novel written by a typically series-based writer, this stand-alone not only stands alone but also apart from the rest of her work (we have received an ARC). First person, a female sleuth, a modern gothic story-line, and Griffiths' own skill with language means that when this book arrives in March (in hardcover), I'll be directing our customers to make sure to reach for it. Michael: The Philosopher's War by Tom Miller. The first in this series, The Philosopher's Flight was the only book in 2018 that I read in a day (well, a night). It had been a book that had slid deeper into my reading pile, after my initial excitement of ordering it, and I regret that regularly, as it will be a book that I will be hand-selling when it arrives in paperback in 2019. I cannot wait for the sequel, however, and I won't make the mistake of even letting it appear on my "To Read" pile. Wendy: 1222 by Anne Holt. Not only does it happen to be one of my favourites, which is always a good place to start, I find, when suggesting something for a gift, but it also doesn't fill a single criteria in the niece's profile. New experiences, like new jobs, often force people into discovering new interests and avenues of exploration. A book like 1222, set in winter and dealing with a train journey, is nearly as opposite as is possible to get, and therefore should provide an escape from the niece's day to day as well. Plus, there's no dog to make her feel further remorse about her schnauzer's passing. Michael: One of the tricks to our particular specialty is that often the last thing that people want to read are mysteries or murders directly relating to their profession, particularly new positions. So while there are any number of ship murders which could be suggested, I think that instead I would suggest that the aunt buy a book that will touch on nearly all the topics that the niece has in interest in: Good Omens. It may be especially topical given that the niece will likely be confronted with the on-screen adaptation of the book coming out next year, but the Terry Pratchett and Neil Gaiman co-authored classic is not just a delightful and light-hearted look at the Apocalypse, it addresses the hobbies and philosophical interests of the niece. Also, it has a delightful and loveable pup named, appropriately, Dog. Two different takes on that bonus questions. Both intriguing. Thanks so much for answering all of our questions.